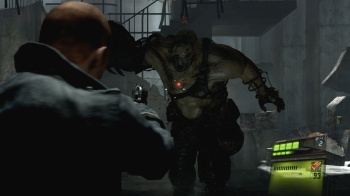 Sony Tweets a solution to the day one Resident Evil 6 patch problem, but there are issues with the solution. If you pre-paid and downloaded a digital copy of Resident Evil 6 for the PS3, you may be wondering why it doesn't work. At least, you'll be wondering that if you happened also to download the first patch for the game, since that patch seems to be what caused PS3 users' games to swirl down the metaphorical digital drain. Sony Tweeted a solution to the problem earlier this morning: "please delete and re-download [Resident Evil 6]." Does that actually solve the problem? Weeeell, yes and no. Yes, PS3 users will get a playable version of Resident Evil 6 if they delete and re-download, but they may notice some loss of functionality. Capcom warns that only people who see the error message should follow Sony's advice; everyone else should hang tight, because the solution to the download problem creates further problems. "Please note however," said Capcom, "these people [who delete and re-download] won't be able to play against disc owners on a temporary basis. We are working with SCEE (Sony) to fix this issue and a patch is imminent to fix the issue." Also, people who downloaded from the PSN store won't be able to access RE.net, the networking service that tracks stats and achievements which Capcom announced to some fanfare back in August. Capcom promises to keep the internet informed on its progress in fixing this snafu. Those of you who bought the disc version can rest easy; this doesn't affect you at all.